Why you Need a Pressure Washer? The best residential pressure washers are going to save you an enormous amount of time and effort compared with the garden hose. Time is a commodity and you don’t want to be spending unnecessary amounts of time on your hands and knees, scrubbing floors, do you? We thought not. They take the pressure off, by helping you get the job done quickly and easily. There is no need to block out a whole weekend to clean your drive way, and no back ache from hours spent bent over scrubbing a deck. Pressure washers can help you keep your car, your garden furniture and your patios looking as good as new. Whatever you are looking for, be it a powerful, lightweight machine or a real deal, there is a best-rated power washer out there for you. This article will help you decide which high-pressure cleaner is best for you. Difference between a pressure washer and power washer? Is there a difference between the both? You may have seen both terms used to describe the same thing and have been left wondering “what is the best power washer for home use?”. A powerwasher uses hot water, whereas a pressure washer may not. The temperature of the water decides whether your machine would be considered a pressure washer or a power washer. The best power washers will enable you to remove stubborn objects such as chewing gum by upping the temperature. Power washers work well when there is a lot of soiled area to deal with; this may not be so prevalent with residential power washing. They are also good for killing moss and getting rid of mildew or mold and overall cleaning power. A pressure washer uses cold water or water of a normal temperature and will not feature a heating unit for the water. The best pressure washer is best suited for cleaning things like concrete, brick, and cars. Other than that, there is absolutely no difference. You will see the terms used almost interchangeably in power washer reviews. Gas-powered pressure washers tend to be much more expensive than the best electric pressure washers. When you are purchasing a gas-powered power washer, you are buying a machine that is built to last. They tend to be more powerful and are therefore suited to the more heavy-duty cleaning jobs and will be good for anyone using them often. You aren’t limited by a power cord with a non electric pressure washer, but they do tend to be much heavier, bulkier and harder to move around. They tends to be distinctly lighter, and much smaller, making it much easier to maneuver. They are also cheaper than most gas powered pressure washers making them a more viable option if you are on a budget. However, it is worth noting that the electric models does not last as long as gas powered models as a rule. They aren’t as hard wearing and are often mostly made of plastic, meaning there is the possibility of more breakages. You are also limited by the power cord, as you will only be able to move it so far. This is a powerful gas model that runs at 3200 PSI and 2.8 GPM. This is the most powerful washer out of our top three and the most expensive. It has a powerful Honda engine and comes with a kink and abrasion resistant 25-foot hose, making it less susceptible to general wear and tear. This hose will be able to withstand heavy-duty use and you won’t have to be tackling tangles all the time. The PS3228-S comes with 5 different nozzle tips, allowing you select the right one for the job you are doing, for the best results. There is onboard storage for all your accessories, meaning you won’t have to keep going back and forth to grab the things you need to complete the job. Gas pressure washers tend to be heavier and a bit more difficult to maneuver. This product’s pneumatic tires mean you don’t worry about it being difficult to move about. The hose fitting isn’t in the best of places, and it is easy to catch it on the exhaust which might result in the hose melting – so this is something to be wary of. But, overall this is the best Honda pressure washer. 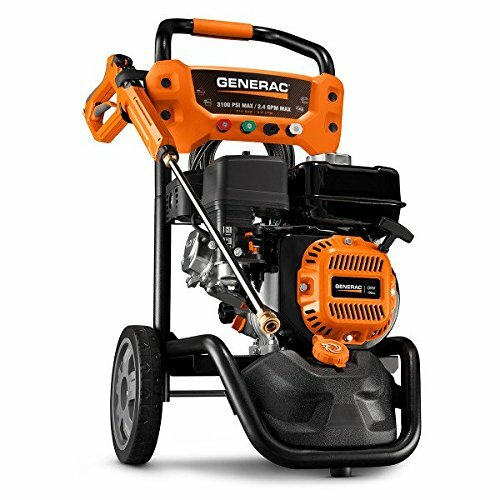 Second on our list of the best pressure washers is the Generac 7019. This isn’t quite as powerful as the Simpson, but it will still pack a punch when it comes to removing dirt and grime. The spray gun comes with an integrated Power Dial, which allows you to quickly adjust the pressure while you work. You won’t have to stop what you are doing to change the nozzles on the product. You can just select the setting you need and go. You can choose between four different settings: car, wood, concrete and soap. The detergent tank on this washer holds half a gallon and the hose is the standard 25 feet in length. Similarly to the Simpson pressure washer, it’s easy to melt the hose on the exhaust. They can also move man gallons per minute through the hose. You will need to bear this in mind while using it because, after a while, replacement hoses get costly! This product is lighter than the Simpson, so this is worth considering if you have found other products hard to move around in the past. Third on our list is another Simpson Cleaning pressure washer. The PSI and GPM are similar to that of the Generac. Cheap gas washers are hard to find, but at the moment this is the cheapest on our list and has a lot of cleaning power and a great flow rate. It’s still up there regarding gas pressure washer ratings and is equipped with a powerful Honda engine. The kink and abrasion resistant hose is resistant to general wear and tear, making it ideal for heavy-duty use. The hose is nowhere near the exhaust on this model, so you don’t have to worry about melting any hosepipes. It comes with five nozzles which you can switch between depending on the job. There is a neat holder for the nozzles, but the design of this has come up against some criticism. The vibrations from the machine have caused the nozzles to escape. To combat this, a new nozzle holder has been designed. 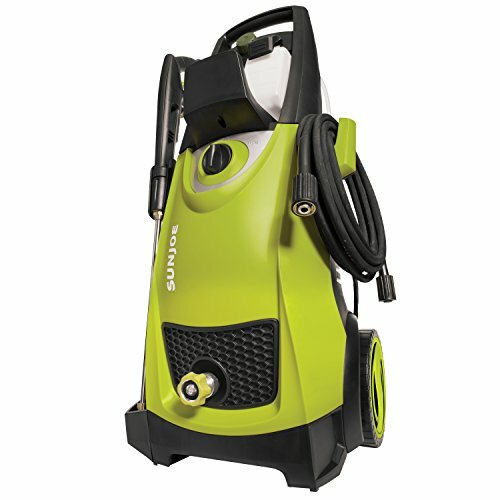 The Sun Joe SPX3000 is the most powerful electric pressure washer on our list. Churning out 2030 PSI and 1.76 GPM, to help you get all of your heavy-duty cleaning done in a flash. You might be surprised to know, that despite it being the most powerful, it is the cheapest on our list. Cheap electric washers are known for not being powerful enough, but not in this case! It comes with five quick connect spray tips, so you can easily switch jobs. It uses a Total Stop System (TSS), which shuts off the pump when the trigger is not being depressed. This saves energy and helps preserve the life of the pump. It also has two detergent tanks on board, so you can swap jobs without having to empty and refill the detergent reservoir. The power cord is 35 feet in length, which should give you enough length to complete most tasks without having to get the extension cord out. As with most electric units, many of the parts are made from plastic. The hose connector is known to be a bit flimsy, resulting in leaks and breakages. Despite this, it is still one of our top-rated pressure washers. This pressure washer is slightly more expensive than the Sun Joe and doesn’t deliver quite so much power. Even so, it is one of the top rated electric models. It will still make light work of cleaning your car, your patio or your decking area and it’s easy to assemble. All you need to do is attach the handle, insert the hose reel, and you are ready to go. The power cord is the usual 35 feet, affording you enough room for maneuver. This pressure washer comes with two spray lances; one which allows you to produce a turbo spray for any particularly stubborn areas, and another where you can adjust the pressure. As with the Sun Joe, there are reports of leaks due to the plastic components, meaning there can be some wastage. 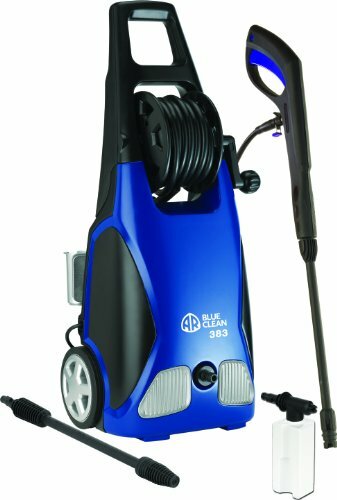 This is the lightest pressure washer and also the smallest, and will be useful for anyone who can’t lug about heavy items. 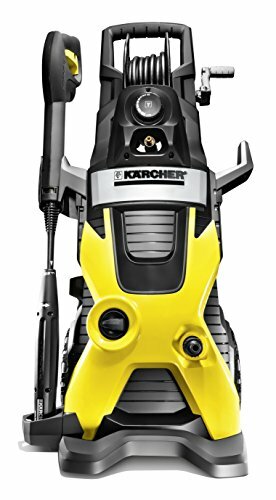 This Karcher pressure washer is more expensive than the other two, but still nowhere near as expensive as a gas pressure washer. This product comes with two different wands. The first is a Vario Power Spray want which enables you to switch from detergent to high-pressure spray. It also allows you to adjust the pressure of the water while you are using it. The second wand lets you up the pressure further, making light work of a tough job. There is also an adjustable detergent flow dial, letting you decide how much detergent you want to use. The Karcher pump has this neat feature that allows you to draw water from a standing source. This is the only pressure washer that you can still use if you don’t have a faucet. If this is a feature you are interested in using, you will need to purchase an additional part. As with each of the other electric pressure washers, there are reports of leaking hose connectors and most people replace them with a brass one. Pressure washers have so many uses around the home, and they can make time-consuming chores into comfortable and enjoyable ones. You can clean a wood deck with a pressure washer. If your decking is starting to look dirty and tired, you can make it look as good as new. Move any furniture or items that might move around or break, and give the deck a good sweep. You are then ready to pressure wash your deck. You can also clean fencing , but be careful not to damage the wood with too much pressure. If you wash your car with a pressure washer, you will save a heap of time getting it sparkling clean. Washing your car can be a laborious task, but using one will speed up the process no end! You can get a particular pressure washer soap recipe which gives your car a high shine. They are also perfect for driveways and garage floors and using one will help you remove grease and oil and leave your driveway looking pristine. You will need a heavy-duty detergent to do this kind of job. They are also perfect for cleaning home exteriors, be this brick, concrete or even things like windows and will have your house looking like it is a new-build in a flash. They are also great for cleaning things like grills, which can be hard to clean with all that stubborn grease. The features you will be on the lookout for when you are selecting the right unit will depend on the job you are going to be using it for. If you are going to be using it daily, your criteria will be different than if you will be using it once a month or less. If you are using it on a frequent basis, you’ll want something heavy duty and hard wearing. The more you use it, the more wear and tear it will have to deal with. You might look at the option with the best hose if you will be using it all the time. Hoses are probably the thing that is at the biggest risk of getting damaged. Selecting one with a heavy-duty hose will reduce the possibility of damage. If you are using your pressure washer day in, day out and for different purposes, you will need multiple nozzles. If you can’t effectively adjust the pressure, it will be useless if you need it to do all kinds of different work. If you aren’t going to be using your pressure washer so much, you may have different considerations. You might be looking for a cheaper version for sporadic use, or looking for a small pressure washer if you don’t have a lot of storage space. You may also be watching the weight of them, because some of them can be very cumbersome and awkward to move. If you are just looking to use if for small jobs around the home, a smaller machine might be for you. The top reasons for purchasing are the time and the effort that you save. A pressure washer cuts cleaning times down an incredible amount. You can go from spending a day cleaning your driveway, to it taking you hours or even minutes. If you are pushed for time, it is a great investment. Reducing amount of elbow-grease you are putting in is another great reason. A hard days’ work resulting in a backache and sore knees will be a thing of the past if you buy one. They cut out a lot of the manual work which is usually part of cleaning. Pressure washers are incredibly efficient, and they might just do the job better than if you were doing it yourself. Pressure washers can be rented, but if you’ll using it often, this may not be a viable option. They can be expensive to rent, so if you are going to be using one repeatedly, it might be more sensible to buy one. They tend to either be rented out on a day rate or for a set number of hours. They range from about $50 to $100 to rent a day, so you can buy an excellent pressure washer for the same amount as you would be spending on a few days’ work. Where can I rent a pressure washer? If you are dead-set on renting one you can rent from places like Home Depot or similar. A pressure washer is a great investment for any home in the US and UK. There are so many chores you can employ, saving you a lot of time and effort. In this day and age, everyone is pushed for time and an investment that saves you time and effort has got to be a sound one. Making your chores, less of a chore is a must, and a pressure washer does just that. Much like the purchase of a lawnmower, much time and consideration go into the process, because they are a great investment.